Montana center Cy Sirmon snaps the ball to backup quarterback Cam Humphrey during practice on Wednesday at Washington-Grizzly Stadium. 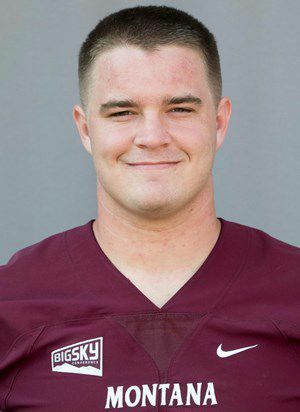 MISSOULA — Montana senior offensive lineman Cy Sirmon recalls his dad saying over the years that he wished he could’ve played center when he suited up as a four-year defensive lineman for the Idaho Vandals. This spring, Sirmon has moved to center for the Griz and has been taking first-string reps there as he learns his fourth position in as many seasons. It’s a position he has minimal experience with, but it’s one in which he finds helpful encouragement from his dad, John Sirmon, one of six other family members who has played or is playing college football. Sirmon and his family, who have supported him through each position change, talk every day during spring camp, even if it’s not about football, he said. He finds a sounding board to reflect on how he did in practice with his dad, his grandfather who played football for the Washington Huskies and his mom, who he described as someone who loves football and as the person from which he gets his intensity. The conversations between Sirmon and his dad don’t delve too much into the X’s and O’s of center since his dad didn’t play there in college, although he was recruited to play that position, Sirmon said. But when Sirmon needs to talk football, his go-to call is his dad. “They’re all really great resources, but I’d have to say I call my dad probably the most when it comes to crunch time if I’m not feeling like myself or if I’m trying to overcome something on the field,” Sirmon said. After playing linebacker as a freshman and defensive end as a sophomore, Sirmon moved to the offensive line last season, playing in all 11 games and starting nine. As the right guard, he began to learn the offensive line calls and schemes, making this year’s move easier. The biggest adjustment for the 6-foot-3, 272-pound Sirmon at center has been snapping the ball accurately while taking his first step at the same time. It’s a mostly new position since he only played center for half a season as a high school freshman and for the final drive against Drake last season. “I think that the distance that that group travels and how far they progress will dictate the number of W’s we have next fall,” Hauck said on Monday. Griz quarterback Dalton Sneed has been impressed with the progress of the group. Sirmon is a player who Sneed singled out as someone who’s taken the next step in the spring. KALISPELL — Montana senior Cy Sirmon has spent time working on his grip this spring since he moved to center and has had to snap the football.